Virginia is a Milwaukee/Waukesha area native. Those who know her well describe her as thoughtful, caring, persistent, intuitive, driven, and intentional. Her passion for education extends outside the 4 walls of the Dojo, with over 20 years experience teaching children in a variety of settings: homeschool mom, Sunday School teacher, children’s worship leader, elementary history and language arts teacher, and children’s “book publishing” facilitator. Her love for books and a well-crafted phrase is matched only by her love for Martial Arts. 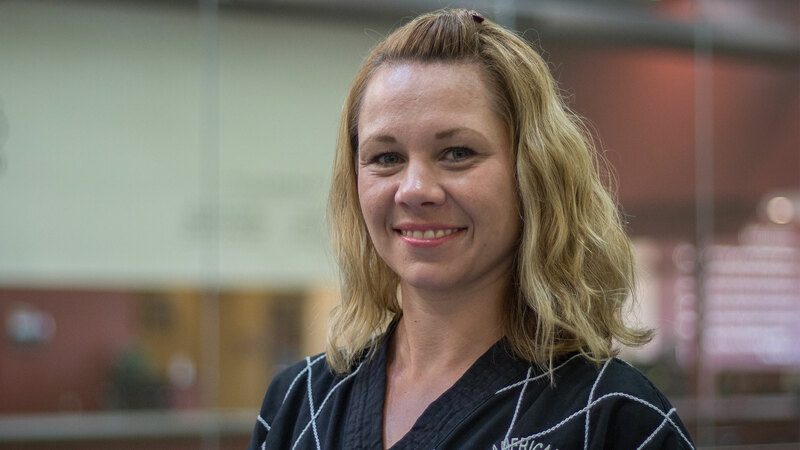 Virginia, currently a 2nd degree Black Belt in both Taekwondo and Hapkido, began training in Martial Arts in 1994. She earned her first degree Black Belt in 1997. Since then she has continued training and teaching, and has been instrumental in operating American Dojo while developing the academy programs alongside her husband, Dean. Her involvement at the Dojo over the years has taken different forms, to greater and lesser degrees as personal demands of home and children grew and evolved. A proud mom to 5 amazing kids, she brings a wealth of experience, wisdom, and humility in the area of inspiring children towards excellence while supporting parents…. things that are a big part of American Dojo’s purpose and culture. Most recently, Virginia has founded and developed both the Excellent Kids program at American Dojo (for ages 3.5- 6yrs) as well as the DojoFit Kickboxing program (for teens & adults). She is particularly passionate about both early childhood development and fitness, and it shows in the success and rapid growth of these two programs. In addition, she has authored/developed the DojoVirtues curriculum as implemented in the Youth & Family Martial Arts program. Virginia believes that Discovery and Exploration are the most powerful of teachers. Her aspiration as an educator (and a mom) is to show children where to look, without telling them what to see. The Excellent Kids program approach to Character Development fits perfectly with her philosophy in this area. Regarding fitness, Virginia feels strongly that exercise should be fun, and empowering. Participants of the DojoFit Kickboxing classes will often hear her mantra of “Come on! Let’s celebrate what our bodies CAN do”. DojoFit members find that their bag-slamming, sweaty celebrations with Virginia (AKA workouts) reap GREAT rewards…. dropping fat and inches while sculpting lean muscle. Virginia views martial arts as being tremendously beneficial for women and girls in particular. She has a goal of inspiring more females to train in martial arts and become leaders in an industry which continues to be heavily male-dominated. To this end, she offers low cost self-defense seminars within the community a number of times per year. She also provides “Girls Empowerment” martial arts workshops to local Girl Scout troops, free of charge. For me, Martial Arts is lifestyle, a journey… The one thing better than simply training in martial arts, is to teach it. To see the spark ignited in the eyes of a beginner when they discover their hidden potential, it’s amazing!